China, 1700s. 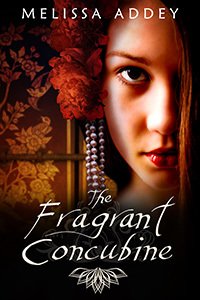 The Emperor conquers a new territory and a woman is sent to the Forbidden City as a concubine. The Emperor falls in love, but is she really who she says she is… and is he in danger? Based on legends that grew up around a real woman. Melissa is definitely an author to watch. She has a remarkable take on stories that grip the reader. Combines an exotic imagination with a well researched background. combines a vivid imagination with a well researched background. more gripping with time. Careful research informs the rich detail. Melissa Addey is certainly a name to watch! Absolutely loved this book, I’ve read it twice so far! Beautifully described and brilliantly researched, I truly felt that I was there at the Chinese court, surrounded by the gorgeous palaces and observing all the goings on in the lives of the Courtesans .. I could go on and on about this book…loved it! Vivid descriptions bring you into the culture and era where the exciting drama unfolds Stays with you long after you’ve read it. I read this some time ago – and the characters and setting still live with me. Really good read. This book comes alive so much so I can see it being made into a movie. Loved it lots. Great read. Great reading. You feel like you are right in the story of the old times in China. The author researches her historical period and customs and weaves them into fascinating and hypnotic novels with realistic characters. Love her books!